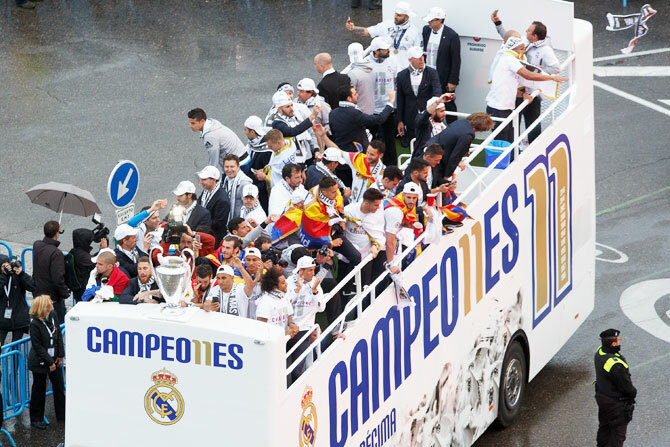 Newly-crowned European club football champions Real Madrid took their Champions League victory celebrations on to the streets of Madrid. Barely 12 hours after claiming their 11th Champions League title after beating Atletico Madrid 5-3 in penalties at San Siro stadium on Saturday, the team assembled at the iconic Cibeles Square in Madrid, joining scores of fans in the celebrations. Rediff.com gives you a peak into Real’s big ‘street party’, held on Sunday.